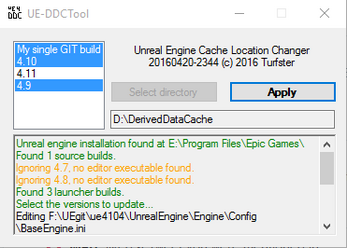 Unreal Engine uses a DerivedDataCache, which it usually creates somewhere on your system boot drive. For most people, this is a smaller SSD that's only supposed to contain your Windows install and assorted programs, not a directory full of small files that can quickly bloom into the dozens of gigabytes. 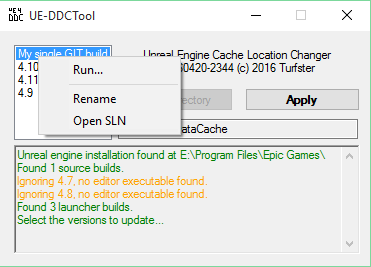 You can edit your BaseEngine.ini to point an Unreal Engine version at another directory, but every time you update, this gets reset and if you forget to edit it again, you end up back where you started: with lots of unwanted data on your boot drive. With this tool, it's just a question of remembering to run it and clicking apply next time you patch your Unreal Engine install.